We invite you to browse the testimonials below to learn about some of the projects we have completed. We hope you find that our customers’ comments confirm our professional integrity. 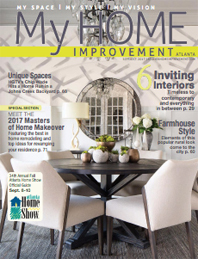 “Adam at Castlehaven Construction in Dunwoody built my dream sunroom – and they taught me (a naive homeowner) an important lesson in how to shop for a good contractor. They gave me references to check. My project was done in a timely manner (within 5 months), on (my) budget. The price included the best insulation, and wood-wrapped steel supports on ground level. Adam suggested a beautiful white washed pine for the vaulted ceiling. The windows were top quality. My work with the Lifecycle Building Center led me to insist that we reuse and recycle whenever possible. The project manager worked with me: reused some of my deck wood; installed the most gorgeous pair of 8’ French doors that came from a Buckhead home; sub flooring came from deconstructed production studio set. Adam transformed the chimney wall for my indoor fireplace from an annoying intrusion into the focal point: we covered it with (recycled) pallet wood! His crews were responsive, on time, great with clean up and great with collaborating when we hit decision-points on the job. The craftsmanship is top notch. My room is magnificent. Had bathroom finished in basement. Great tile work. Had fixtures and toilet installed. Repair window leak and various damaged trim work. Alan and the rest of his crew was very professional. Excellent Deck and Screen Porch Builder!! This company was fantastic to work with and very reasonably priced. They came back to address any cosmetic issues that we found after completion of the project. We will definitely use them again and highly recommend them!!! We would hire again in an instant! Adam and his team did a great job finishing our (very large) basement. We were very pleased with all of the work, as well as Adam’s attention to detail and willingness to modify the project as we went along to meet our needs. We would hire him again in an instant! Adam Pollock and his crew at Castlehaven Construction were the best contractors that I’ve worked with. They were honest. The price they gave me was the real price. No hidden fees added on. They were polite, and they did a great job. We started working with them when we bought our house 5 years ago. They refinished my kitchen among other things and it looks great! We were on a budget and instead of replacing the cabinets he was able to scrape off the old paint and reface the beautiful natural wood that lay beneath. It saved us a lot of money and looks great. We have been using them ever since for all the odd jobs around the house. We even called on them after the “flood of 2009” They even removed the mold and charged me 1/3 less than the supposed mold expert who took our money and didn’t do any work. I highly recommend Castlehaven Construction. We remodeled our bonus room above the garage in to a home office with new flooring, walls, insulation, paint and added a split ductless air conditioning unit. Through every step of the project Alan and Adam kept my wife and I updated. They transformed a room that was once a narrow space into a brighter, wider, and more usable space. I would call on Castlehaven Construction again when we are ready to remodel the attic without hesitation. AS a REALTOR, I rely heavily on the contractors I refer as I put MY REPUTATION on the line. 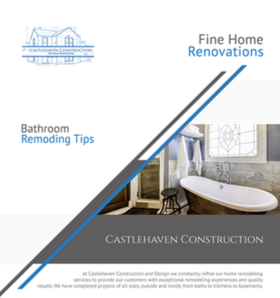 Castlehaven Remodeling stands behind their word, are knowledgeable, priced fairly, dedicated to doing excellent work and making satisfied and happy clients. I will continue to refer Castlehaven Construction. We have used Alan and his team numerous times over the past 2 years, from small items to remoldeling the guest bath, replacing toilets and sinks, the water heater, etc. They have always been reliable and performed quality work. We’ll certainily be using them in the future and would highly recommend them. Alan is a caring and honest person that I believe works hard to do the best job.